This prototype car seat can tell when a driver is sleepy. We've previously seen spectacles that come with a gadget designed to vibrate and prevent sleepy wearers from dozing off at inopportune moments, but a prototype car seat that does a similar job takes the idea a step further. Pink Tentacle reports that the proof-of-concept seat, developed by researchers at three Japanese educational institutes and an industrial manufacturer, is capable of detecting not when someone has already dropped off but when they're about to fall asleep. 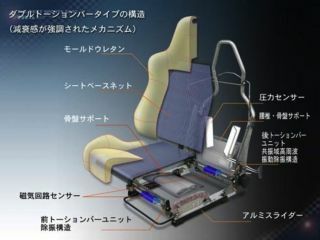 The system avoids forcing drivers to wear heart monitors and other equipment by embedding all the electronics in the seat itself. These include pulse and respiration monitors that are attuned to the physiological patterns produced by a person in the 10 minutes leading up to them dozing off. When those patterns - as established through testing already sleepy volunteers - are observed by the seat, studies show that the driver is indeed on the verge of falling asleep at the wheel. Although the system is still incapable of doing anything about the impending accident, the researchers plan to incorporate an alarm function that should see the device on sale in Japan within five years.